Your commitment is key to continue assisting us with providing FREE concerts to the local population and opening up possibilities. 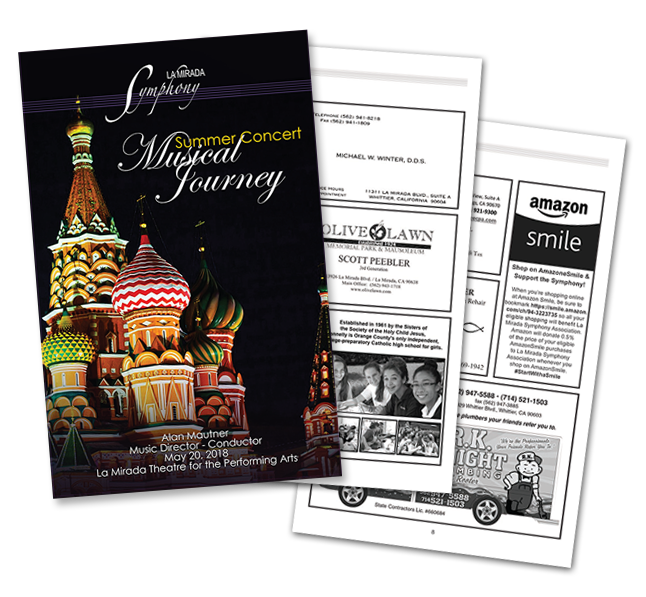 Your ad will appear in ALL booklets during the season. We will send you an email to confirm receipt of your check and artwork. The La Mirada Symphony strives to maintain its policy of offering FREE quality concerts to the residents of Southern California. The La Mirada Symphony is a California 501(c)(3) Nonprofit Organization. Your donation today is tax deductable. Our Federal ID number is #94-3223735. Thank you for supporting the performing arts.